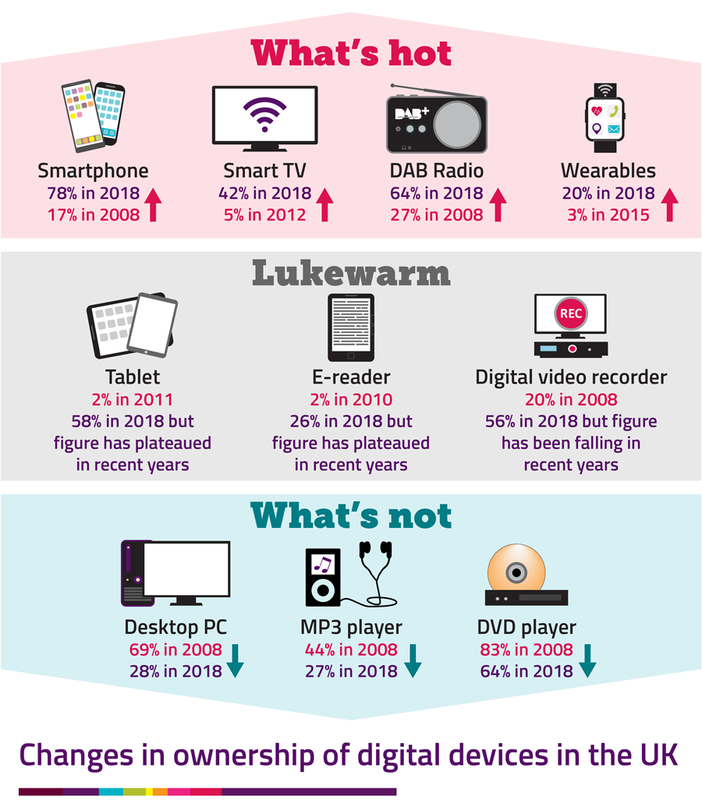 21 November 2018 - London, United Kingdom: Brits are ditching their DVD players and desktop PCs and increasingly turning to newer technology – with smart TVs and smart watches on the rise – Ofcom figures reveal. Shoppers in the UK are predicted to spend billions of pounds again this year on Black Friday and Cyber Monday, and much of that is forecast to be spent buying tech online. So Ofcom has crunched the numbers on which tech devices people have been buying in recent years, and which ones they’re getting rid of. Smart TVs, smart watches and smartphones are all among the digital devices that have seen significant increases in ownership in recent years. The rise of these devices comes as more and more people need a constant connection to the internet, with internet users claiming to spend an average of 24 hours a week online. By contrast, MP3 players, DVD players and desktop computers seem to be falling out of fashion as smartphone use continues to grow, particularly for streaming and going online. Tablets and e-readers may have hit their peak. Ownership of both is significantly higher than seven years ago, but has plateaued in the last few years. Ofcom now measures ownership of smart speakers (13% of households) and virtual reality headsets (5%). The first VR headset went on sale in the UK in 2015 – a year earlier than smart speakers, which have been quicker to capture the imagination of tech shoppers. Other emerging trends include wearable tech, such as smart watches and fitness trackers. One in five households now use these devices, and ownership has been doubling every year since 2016. E-commerce has transformed the way we shop. Ofcom’s research shows that seven in ten adults (69%) now shop online, with around half (52%) of all internet users doing more of their shopping this way. Two in five adults (41%) use their mobile to shop online, and a quarter (24%) do so during their commute. Delivery still seems to be favoured over collection, with less than half (47%) of people using a ‘click and collect’ service, and only one in five people (19%) collecting something from a parcel locker. Most people are choosing next-day delivery (58%) rather than paying for same-day delivery (28%). An even smaller proportion of consumers (just 10%) buy something online and have it delivered within two hours.